Save the dates for BACARDÍ NH7 Weekender 2017! | WhatsTheScene? Save the dates for BACARDÍ NH7 Weekender 2017! 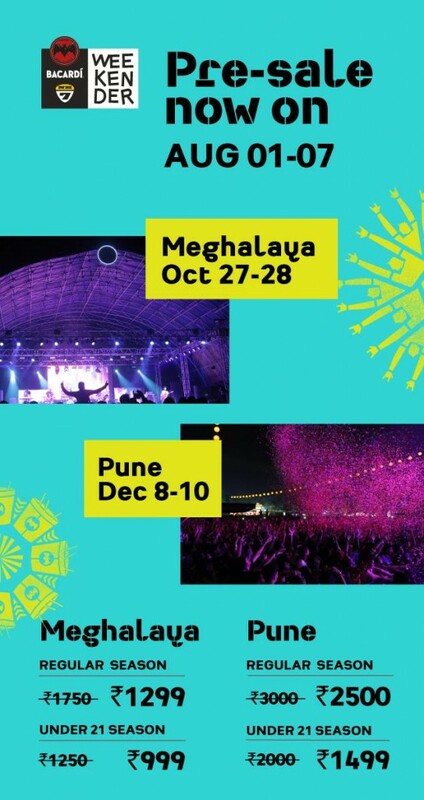 In its eighth edition, BACARDI NH7 Weekender will head to the gorgeous hills of Meghalaya on October 27-28 and back to the city it calls home, Pune on December 8-10. The pre-sale is now on and season tickets can also be purchased at https://insider.in/nh7-weekender/, with special prices for those Under 21. Since its inception, the BACARDI NH7 Weekender has featured over 450 artists from India and around the world, across a variety of genres to over 400,000 fans. The 2016 edition witnessed performances by Steven Wilson, Farhan Akhtar Live, Shankar Mahadevan, José González, Anoushka Shankar, Patrick Watson, The Joy Formidable, Skyharbor, Nucleya, Dualist Inquiry and Thaikkudam Bridge. Introduced last year with a vision to take the festival experience to more cities than ever before, BACARDI NH7 Weekender Express Editions lineup and dates will be announced soon. The day-long editions offer plenty to look forward to with some of the country’s biggest acts.